This blog has been a lot of fun, but for the time being, we are moving on to our new project: http://www.foodandbrews.com/. Food and Brews contains much of the same content, and will be regularly updated with new recipes, food thoughts, beer reviews, and homebrew experiences. Please visit, and let us know what you think! As I was browsing around Whole Foods looking for something I haven’t tried, the Caldera cans practically burst off of the shelf with their brilliant colors. High end beer in a can? Who am I to judge until I give it a try! This has made me a believer in the can. While I’ll never shy away from some inexpensive PBR or some High Life, it’s great to see some high quality, high flavor brews in the same light compact container. These will help make by baseball season full (and my wallet empty). 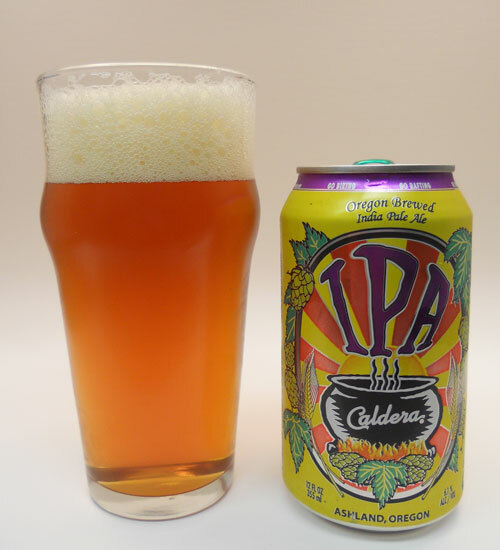 This brew would go perfect with some grilling, and the can is perfect for some outdoors action. I thought I would branch out and try something international and not an IPA. With so many options to choose from, I started with a lower price point and worked my way up. Low and behold, the $2.49 Pint of brew was called out my name. 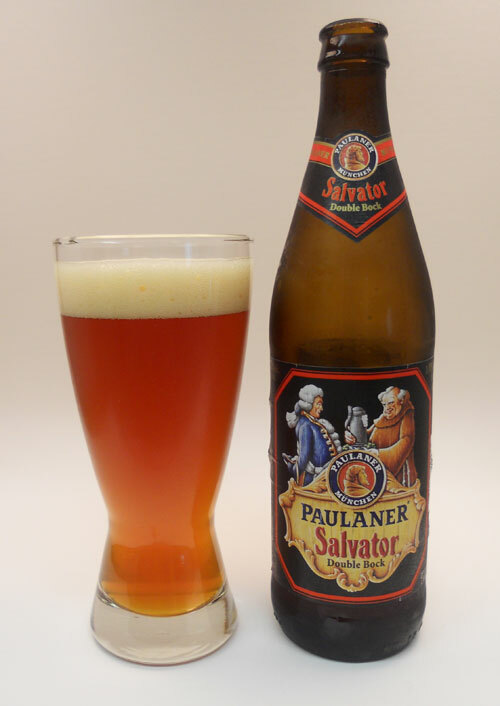 "Paulaner Salvator is the founding father of all Bavarian stouts, and the originator of all "-ator" beers. With an alcohol content of 7.9, it is not only the strongest beer brewed by the Paulaner Brewery, but also has the most tradition: Paulaner Salvator has been brewed from 100% Munich malt to a handed-down recipe for 375 years. Today, it is the highest-selling "Double bock" beer in Germany. Paulaner Salvator is dark, full bodied and strong, and wonderfully malty in flavour and aroma - a perfectly balanced, round, quaffable stout specialty." Grab yourself a Bratwurst and some sauerkraut—this brew needs something with a fair amount of flavor to play off of. Any kind of grilling would be good, or some nice roast beef. Can’t beat the price. When we're feeling rich and fancy, we throw in a hearty meat dish into our dinner rotation. At first glance, this meal sounds a bit boring, but it's actually very tastey. I was not able to locate the Purple Sprouting Broccoli that the recipe calls for, so I just used regular 'ol broccoli. Once again, I wasn't able to get my meal on the table in 20 minutes. It was more on the side of 40 minutes. My pork chops were really thick, and they took significantly longer to cook that the recipe stated. Again, I don't think 40 minutes is bad for a great dinner, but the advertised 20 would have been nice too! This meal was the second most expensive, $12.35—$8.00 of that was the pork chops. We could have gone cheaper with them, but like I said earlier, we were feeling rich and fancy. Still, the price isn't too bad, we made 3 pork chops, so my husband has a good hearty lunch to take to work today. I'm not a big meat-eater, but this was very good. 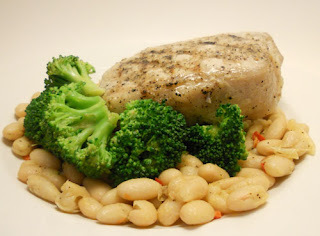 I think my favorite part was the Cannellini Beans sauteed in oil, garlic, and chile. They were so creamy and rich - the perfect side for a gnarly pork chop! The broccoli is finished with a squeeze of lemon juice, which keeps it bright so it can hold its own with the rich beans and grilled meat. Time aside, I'll be making this one again. Once a week we usually throw a "big salad" in the mix for our weekday dinners. It's a great way to keep things light, fresh, and fast. 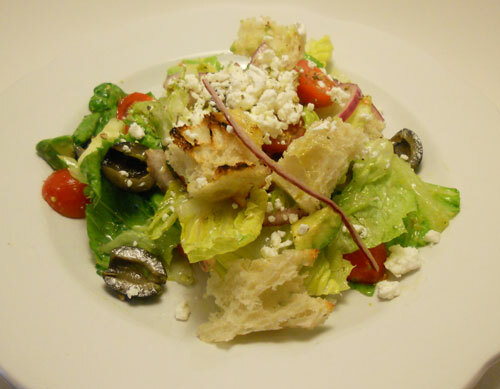 Jamie's Gorgeous Greek Salad is full of flavor, colors, and just plain yumminess. Even considering this meal was a salad, it took me about 40 minutes to get it on the table. Again, I'm mostly being slowed down by prep. There are a lot of items to chop, but this meal is well worth it. The dressing is made bright with lemon juice, and red onions marinated in red wine vinegar give an additional burst of flavor to the salad. So far, this has been the most expensive meal coming in at $14.65. The pricey items were the avocados, tomatoes, feta cheese, and ciabatta bread. The ciabatta was $3.50, but it was a delicious grilled treat within the salad. This salad has lots of fun ingredients, loads of flavor, and can stand alone as an actual meal. I did make one little change—I know, already making changes to a recipe—I added sliced cucumber. Cucumber is one of my favorite salad ingredients, and I couldn't stand to have a Greek Salad without it! 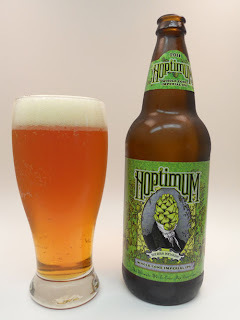 Hoptimum, Sierra Nevada Brewing Co.
For this beer, we really have to start with the label. Being new to home brewing, I picked up a copy of the Jan/Feb issue of Brew Your Own, and that's when I got my first glimpse at Hoptimum. The label just popped off the page, and I started keeping an eye out at local shops to see if I could get my hands on some of it. As soon as it was available I bought a couple bottles. I immediately drank one, and saved the second for a review. "A group of hop-heads and publicans challenged our Beer Camp brewers to push the extremes of whole-cone hop brewing. The result is this: a 100 IBU, whole-cone hurricane of flavor. Simply put —Hoptimum: the biggest whole-cone IPA we have ever produced. Aggressively hopped, dry-hopped, AND torpedoed with our exclusive new hop varieties for ultra-intense flavors and aromas. Resinous "new-school" and exclusive hop varieties carry the bold and aromatic nose. The flavor follows the aroma with layers of aggressive hoppiness, featuring notes of grapefruit rind, rose, lilac, cedar, and tropical fruit—all culminating in a dry and lasting finish." I'm hoping Sierra Nevada makes this brew annually as a special release. They are doing some great things with their own proprietary hops, and I can’t wait to see what they come up with next. This was just an all around fun brew. For a food pairing, you'll need something to be able to stand up to the bitterness. Any kind of spicy food would probably be the best although the hoppiness may enhance the heat a bit. Most BBQ beef would stand up great with this. Stir -fries are one of my favorite meals—they're healthy, relatively fast to make, and are a fun way to change up the weekly dinner menu. 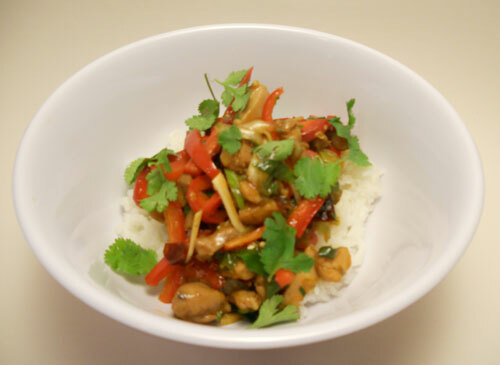 Jamie's Szechuan Stir-Fry makes use of chicken thighs, which is the perfect meat for this dish! The dark meat has more flavor, and really holds up the the spices and herbs in this dish. This meal didn't make it to the table in 20 minutes, it was a bit more like 45. I'm just not as fast at the food prep as Jamie Oliver! Once all of the food was chopped and ready, the stir-frying was really fast. Jamie once again busts out the use of chopped herb stalks—I gotta say, I'm a fan. It adds so much flavor to the food—try it next time you're working with fresh herbs. The price of this meal was $9.50, which only came out to two dinners. No leftovers this time, but still, where can you get a fresh and healthy dinner for $5 per person? Taste-wise, this meal was superb! The use of dried red chile, Szechuan pepper corns, and sweet chile sauce compliment the chicken and red bell pepper wonderfully without overpowering your taste buds. Then you get the background flavor of garlic, ginger, and scallions, oh my...a great thing. Not to mention the lovely aroma of Jasmine Rice as it all comes together. I'm pretty sure I'll be revisiting this meal in the not-so-distant future—I think it has also taught me some other tricks to try on my standard broccoli, carrot, and tofu stir-fry. Not that long ago, when my husband and I were dating, we spent a lot of our time partying like rockstars. Now days we are mellow, work on our house, cook, homebrew, and enjoy life while we come up with what we're going to do next.